Immunization of cattle, sheep and goats against blackleg, black disease, braxy, malignant edema and enterotoxemias caused by Cl. chauvoei, Cl. novyi Type B, Cl. septicum, Cl. sordellii and Cl. perfringens Types A, B, C and D.
Each dose contains enough antigen to induce a response in the control animal of at least: 0.3 IU Cl. perfringens α antitoxin/mL serum, 10 IU Cl. perfringens β antitoxin/mL serum, 5 IU Cl. perfringens ε antitoxin/mL serum, 2.5 IU Cl. septicum α antitoxin/mL serum, 3.5 IU Cl. 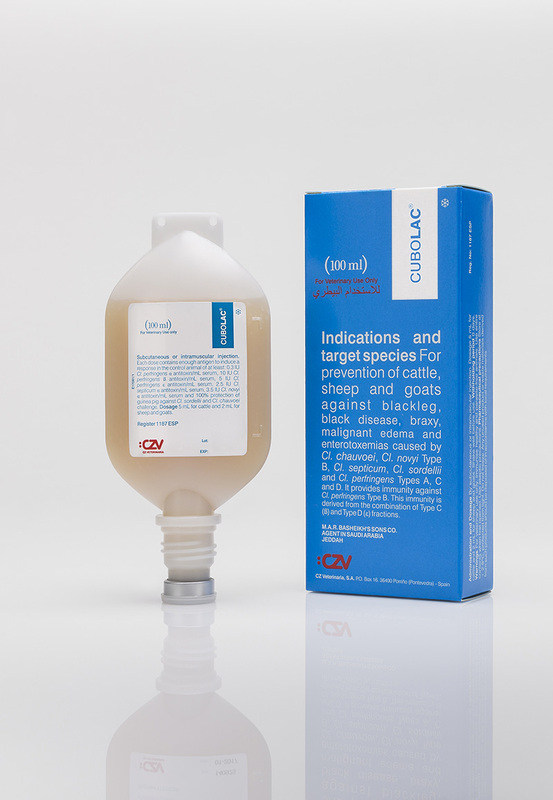 novyi α antitoxin/mL serum and 100% protection against Cl. sordellii and Cl. chauvoei challenge. Adsorbed onto Aluminium hydroxide gel. Dose 5 ml for cattle and 2 ml for sheep and goats. -In breeding season, pregnant females should be injected a fortnight before birth occurs, to enable their offspring to be passively protected against enterotoxaemias. -Young animals born from unvaccinated mothers can be given their first dose at two weeks of age. -Young animals born from immunised mothers should not be given their first dose until they are 10-12 weeks of age.